Do You Live in a Red Zone? And Do You Know the Difference Between a Flood Advisory and Flood Warning? 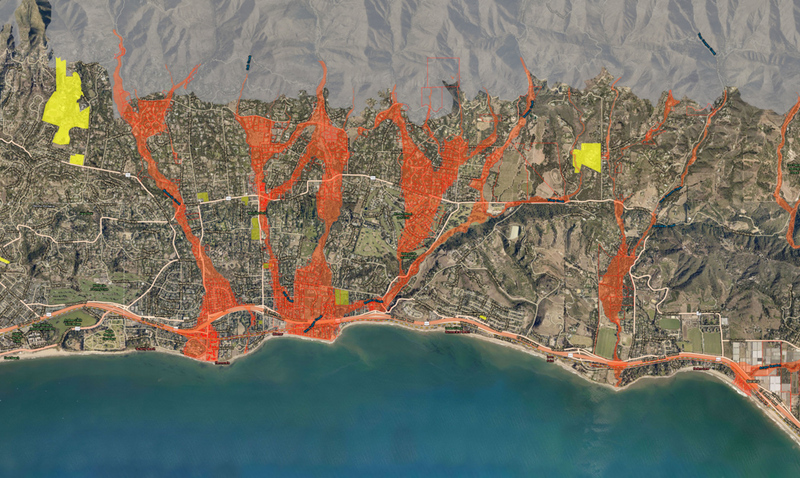 Since recent wildfires and the 1/9 Debris Flow, Santa Barbara County has developed an evacuation map that pinpoints properties in “red zones” at risk for flooding and debris flows. This interactive map ​— ​called Debris Flow Risk Areas ​— ​is online at readysbc.org/maps/, where you can search street addresses and zoom in along creeks and low-lying areas to see if a specific property has been deemed at-risk. Flood Advisory: Issued when flooding may become a nuisance or significant inconvenience. Be aware. Flood Watch: Issued when conditions are more favorable for flooding. It does not mean flooding will occur, but it is possible. Be prepared. Flood Warning: Issued when serious flooding is imminent or occurring. Take action. Flash Flood Warning: Issued when a flash flood is imminent or occurring. Take action. Storm Readiness — Ready! Set! Go! As big rainstorms approach, people in “red zones” may be asked to evacuate. READY: The first stage of a potential evacuation is a WEATHER ADVISORY, which will be issued 48-72 hours before the arrival of the storm. This advisory is the National Weather Service and county storm risk team alerting the community to the storm. Be aware: Closely monitor the storm and have a plan if you’re asked to evacuate. SET: The next step is the EVACUATION WARNING, issued 24-48 hours before the storm. Prepare to leave; arrange transportation for you, your family, and, if necessary, large animals; make arrangements for family members with special needs; confirm your evacuation plan; gather items you’d like to take with you. Check on your neighbors. GO: Within 24 hours of the arrival of a storm that could pose a risk to life or property, the Sheriff’s Office will issue an EVACUATION ORDER, which means it’s time to evacuate if you are in a “red zone.” People who refuse to comply will not be forcibly removed from their homes, but they should not expect rescue or other lifesaving assistance, according to county officials. Flooding and debris flows may close down transportation routes for several days; if you choose to stay, you may become stranded in the disaster area. • If at any time you feel unsafe, take immediate action and do not wait for a notification to evacuate. Officials may only be able to alert the public with just a few minutes’ notice, or none at all.